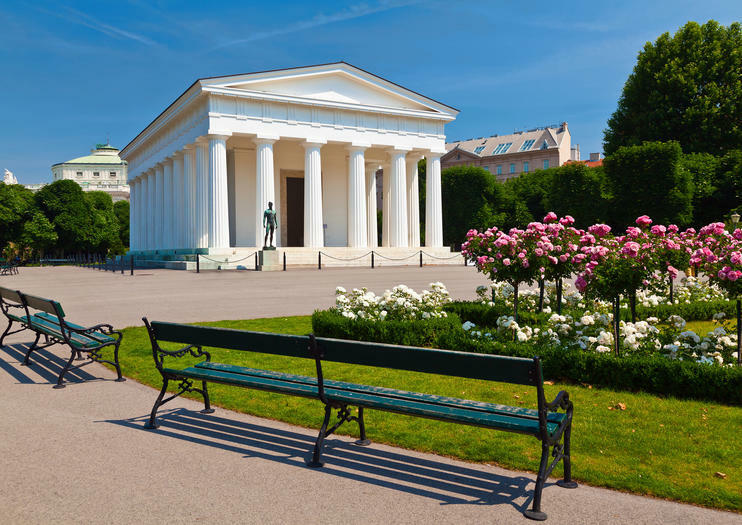 The focal point of the Volksgarten in Vienna is the Theseus Temple. It is a Greek-style temple that was built in 1820-1823 as a replica of the Temple of Hephaestus (Theseion) in the ancient Agora of Athens. It was originally built to house one piece of art, the “Theseus and the Minotaur” sculpture. The sculpture is now located in the Art History Museum. The temple was recently renovated, and as part of the Art History Museum's Modern and Contemporary Art Program, it showcases exceptional works of art one piece at a time. Volksgarten is an elegant park in Vienna that was once a favorite gathering place for the aristocracy. It was designed in a formal French style with geometric flowerbeds and rose gardens. Along with the Theseus Temple, there are several fountains and other interesting monuments, such as the Kaiserin Elisabeth-Denkmal and the Grillparzer Monument. The park is a popular place for relaxing or taking a leisurely stroll.